This photograph takes me back. The family lived near the beach in North Wollongong on Bourke Street. The old house is still there. Seven children, Mum and Dad in a three bedroom home. The house is still there yet high rise and apartment buildings are encroaching. 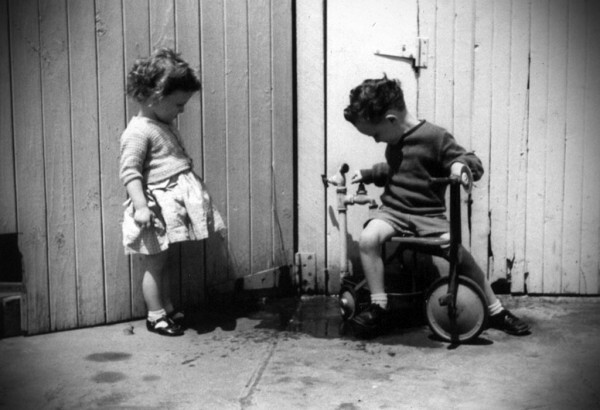 I was filling up the back of the Cyclops Dinky Tricycle with water as my younger sister Mary observed. There were two small holes in the tray and as we rode around the concrete backyard a couple of small trails would be left behind. I have no idea of my age there. Perhaps 4 or 5. Not sure. I was a tiny little mite. About 1963.